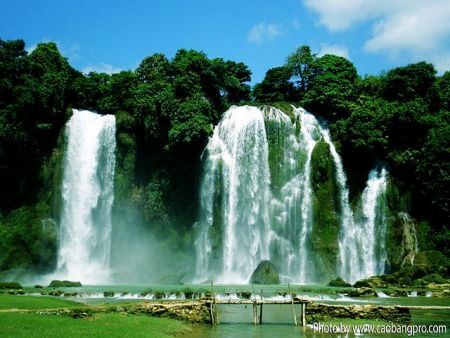 Do you know Ban Gioc waterfall is the largest and the most beautiful fall in Vietnam? Yes, it is the invaluable gift that the nature grants to my country. I've recently figured out that it is also the largest fall in Asia and the fourth largest cross-border fall in the world, after Niagara (on the border between Canada and the USA), Victoria (Zambia - Zimbabwe), and Iguazu (Brazil - Argentina). Situated in Dam Thuy Commune, Trung Khanh district, Cao Bang province, Ban Gioc is near the border between Vietnam and China. It’s over 270 kilometers (170 miles) from Hanoi, and 80 kilometers (43.5 miles) from Cao Bang center. It’s also sometimes called Ban Doc in Vietnamese, and Chinese call it the Detian Fall. The waterfall boasts gorgeous backdrop with lush vegetation and colorful flowers. All make a perfect landscape painting by nature. Ban Gioc includes three-layer cliff, and drops from a height of over 30 meters (98 ft). It has a width of 300 meters (980 ft), which is separated into two parts, called the main fall and the subordinate fall. The smaller and half of the larger are on Vietnam’s territory, while the remaining half is on China’s land. In the summer, due to bulky volume of rainfall, two parts join together to make a large gorgeous fall. Below the falls, there is a large pool of more than 200 meters (656 feet) wide and over 30 meters (99 feet) depth. The fall has water dropping all year long, though water drops slowly in winter. You’d better visit there in the summer, from May to September. Then the water rushes down stronger. Vietnam does not have many large waterfalls. Yet, Ban Gioc is really a precious present of the nature in the northern mountain forest. How do you think about Ban Gioc fall? Is it fascinating? If you’ve visited there, you may want to share your own comments here. I’d love to hear from you! Besides, If you find useful information here, would you mind encouraging me with a Like button? Thank you very much.